Wyland Artist Signed Limited Edition Giclee on Hand Deckled Paper:"Ariel's Dolphin Ride"
About the Art: As a founding celebrity artist for Disneynature, Wyland has contributed original artworks for the premieres of three Disneynature films, "Earth", "Oceans" and "African Cats". He has created iconography in support of Adopt-A-Channel, an effort spearheaded by Disney Resorts to reduce land based debris from entering storm channels and washing into the ocean. In 2010, Wyland's depiction of planet Earth for the launch of the Disneynature brand was translated into a 4,000 square foot supergraphic covering the famed El Capitan Theater in Hollywood, California, to the delight of millions of passersby. Wyland's efforts to support children, education, and sustainable oceans, lakes, rivers, streams, and wetlands are very much in line with the community service goals of the Walt Disney Company. 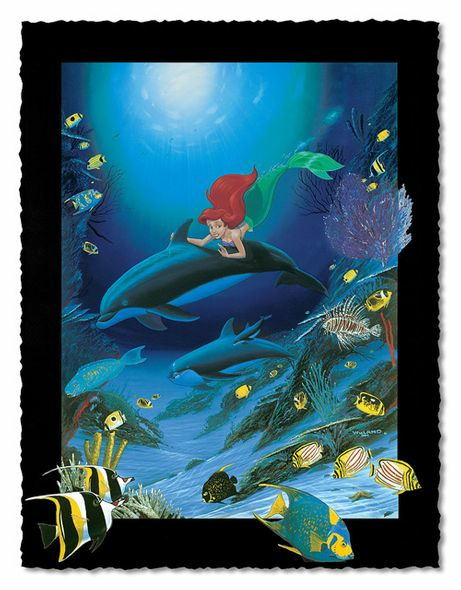 So it's no surprise that when a new Wyland project comes along, Disney fans take notice. Or, as former Disney CEO, Michael Eisner once said, "It's always a treat to see what Wyland has been up to, and it's even more fun to see he's been up to something Disney!" Through his unique marine life paintings, life-size Whaling Wall murals, sculptures, and photography, Wyland has inspired a new generation about the importance of marine life conservation. His company's mission of engaging people through nature-themed art and a more environmentally friendly lifestyle has led to strategic alliances with the United States Olympic Team, United Nations Environment Program, U.S. Environmental Protection Agency, and the U.S. Forest Service. His art instruction series for national public television "Wyland's Art Studio", is entering its sixth season and is currently seen in over 72 percent of public television markets across the United States. And, since 1993, his non-profit Wyland Foundation has set the standard for environmental outreach by teaching millions of families around the world to become caring, informed stewards of our ocean, rivers, lakes, estuaries, and wetlands. The foundation's National Mayor's Challenge for Water Conservation annually reaches residents in over 3,600 cities across the United States; its traveling clean water mobile learning experience has engaged and delighted more than half a million students in the last five years, and the Wyland "Water Is Life" National Art and Mural Challenge draws annual participation from schools in 46 states. The enormous extent of Wyland public artworks (it is estimated that his murals are viewed by more than a billion people every year), his award-winning art galleries, and community service efforts have made him one of the most recognized and beloved artists in the nation. He is considered one of the most influential artists of the 21st century, with artwork in museums, corporate collections, and private homes in more than one hundred countries.